Almost 2 out of 3 non-citizen households in the United States receive some form of welfare, according to a report released by the Center for Immigration Studies (CIS). 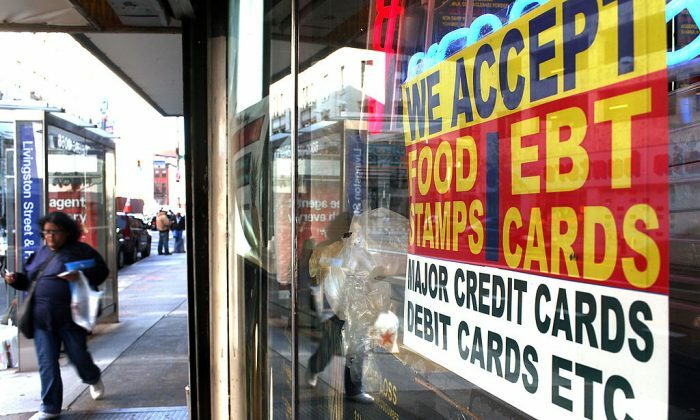 The report, released Dec. 2, found 63 percent of non-citizen households in the United States tap at least one welfare program, compared with 35 percent of native households. The findings are based on the Census Bureau’s latest 2014 Survey of Income and Program Participation. Non-citizen households are using welfare food programs and Medicaid at twice the rate of native households, the study found. There are a total of 4.68 million non-citizen households receiving some form of welfare and the numbers don’t improve over time. For non-citizens who remain in the country for more than 10 years, the percentage of welfare recipients rises to 70 percent. In this study, non-citizens are defined as long-term temporary visitors, such as guest workers and foreign students, permanent residents who haven’t yet naturalized (so-called green card holders), and illegal immigrants. “Of non-citizens in the Census Bureau data, roughly half are in the country illegally,” the CIS estimates. The new analysis supports President Donald Trump’s worry that immigrants—both legal and illegal—impose tremendous fiscal costs on the nation. Legal immigrants are initially barred from many, but not all, welfare programs; after a period of time in the United States, they are able to qualify. Today, most legal immigrants have lived in the U.S. long enough to qualify for many welfare programs. Some states provide welfare to new immigrants independent of the federal government. The biggest avenue non-citizens use to access welfare is through their children. “Non-citizens (including illegal immigrants) can receive benefits on behalf of their U.S.-born children who are awarded U.S. citizenship and full welfare eligibility at birth,” the CIS notes. The CIS report suggests that a lack of education is the primary cause of immigrants’ high rate of welfare use. To support this claim, the CIS said 58 percent of all non-citizen households are headed by immigrants with no more than a high school education, compared with 36 percent of native households. Of these non-citizen households with no more than a high school education, 81 percent access one or more welfare programs, versus only 28 percent of non-citizen households headed by a college graduate. In an effort to reduce the rate of welfare use among future immigrants, the Trump administration has issued new “public charge” laws. These laws expand the list of programs that are considered welfare, so that receiving these benefits may prevent prospective immigrants from receiving a green card. However, these changes “do not include all the benefits that non-citizens receive on behalf of their children and many welfare programs are not included in the new rules,” according to CIS. The CIS recommends using education levels and potential future income to determine the likelihood of future welfare use for potential green-card applicants, to reduce welfare use among non-citizens.